A young man wrestling with his faith, a man of faith wrestling with his youth. An unexpected friendship lies at the center of Sweet Like Sugar (Kensington Books), Wayne's Stonewall Book Award-winning novel about fate, identity, and getting past our personal prejudices. But it’s also about Kurt Cobain, circuit parties, class stratification in the DC suburbs, Space Mountain, the Book of Esther, the war in Iraq, Israeli dance, Jewish summer camp, Barack Obama, Miami's bar scene, the Holocaust, interfaith relationships, immigrant communities in Jersey City, Will & Grace, crystal meth, kashrut, Sammy Davis Jr., and much more. Buy Sweet Like Sugar as a trade paperback or e-book at Amazon or at Barnes & Noble. Also available as an audio book. In Yiddish, there is a word for it: bashert—the person you are fated to meet. Twenty-something gay man Benji Steiner is skeptical of the concept. But the elderly rabbi who stumbles into Benji’s office one day has no doubts. Rabbi Jacob Zuckerman’s late wife, Sophie, was his bashert. And now that she is gone, he grapples with grief and loneliness. Touched by the rabbi’s plight, Benji becomes his helper—driving him home after work, sitting in his living room listening to stories. Their friendship baffles everyone, especially Benji’s sharp-tongued, modestly observant mother, but Benji is rediscovering something he didn't know he'd lost. The test of their friendship, and their faith, lies in the difficult truths they come to share. With each revelation, Benji learns what it means not just to be Jewish but to be fully human—imperfect, striving, and searching for acceptance. "Hoffman's examination of the intersection between gay and Jewish identity raises potent questions about tolerance and understanding." "Sweet Like Sugar has heart. Don’t tell anybody, but once or twice I even found myself getting a little farklemt." "Charming...touching...Sweet Like Sugar offers universal lessons in the role of fate, a successful gay romance, and one approach in combining a gay and spiritual life." "The author treats a sensitive, relatable subject with intelligence, realistic emotion and a positive outlook toward toward what we can accomplish. It's well written and highly recommended. Five Stars!" "A thoroughly satisfying read for both Jews and non-Jews, regardless of sexual orientation...It speaks to anyone who has ever searched for love, faith, or friendship, or who has ever felt challenged or alienated by any one of those—in a word, everyone." "A compelling story of love and intergenerational friendship." "Tucked into this story of twenty-something search for love is an unforeseen tale of friendship and faith. Perceptive and lively, Wayne Hoffman’s Sweet Like Sugar builds to a surprisingly deep and honest conclusion." "Here is a modern novel about a truly taboo subject: the love of a Jew for Judaism. A young man and an old Orthodox rabbi dance each other out of despair in a story that is beautifully told, profound and funny." 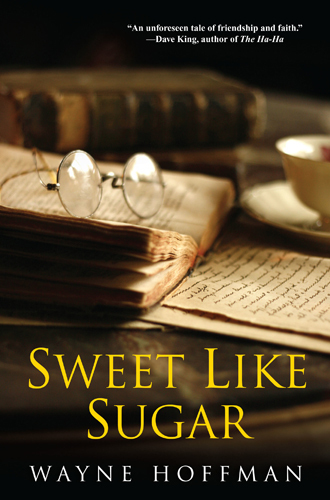 The American Library Association has given Sweet Like Sugar the Stonewall Book Award - Barbara Gittings Literature Award, given annually to English-language works of exceptional merit relating to the GLBT experience. Sweet Like Sugar has won the 2012 Rainbow Award for Best Gay Novel and Best Gay Contemporary General Fiction. The Advocate names Sweet Like Sugar one of the best overlooked books of 2011, praising it for "demonstrating how our human quest is a search for parts of ourselves that can only be found in others." Sweet Like Sugar is named one of the best books of the year in Heeb magazine, beating out books about Nazis, zombies, and the Rolling Stones. New York's Next Magazine lists Sweet Like Sugar as one of the best books of the year, and reports on a local reading. A news feature in Publishers Weekly calls Sweet Like Sugar one of the year's "notable novels," praising it for "breaking new ground in gay fiction." Wayne blogs in The Huffington Post about returning to his childhood synagogue as part of his book tour. Wayne talks about the real-life stories behind Sweet Like Sugar in the Vox Tablet podcast at Tablet magazine. Wayne talks about Nirvana, Dunkin' Donuts, and finding time to write in an interview, on This Show Is So Gay, a radio show that broadcasts around the country, and offers streaming audio and downloadable podcasts. Wayne talks about bringing communities together in an interview in the Washington Jewish Week. Wayne blogs for the Jewish Book Council and My Jewish Learning, about Sweet Like Sugar. He writes about his mother's inspiration here. He reveals what's in a name here. He offers a list of GLBT Jewish books here. And he ponders the downside of digital books here. Wayne talks about rabbis, boyfriends, and his very comfy couch in an interview in San Francisco's Jewish magazine, J. Weekly, and in an interview in Los Angeles' Jewish newspaper, L.A. Jewish Journal, and in an interview in British Columbia's Jewish newspaper, The Jewish Independent. Wayne is interviewed on the on the television show Forward Motion in Montgomery County, Maryland. Wayne discusses Sweet Like Sugar as part of the Twitter Book Club organized by the Jewish Book Council.